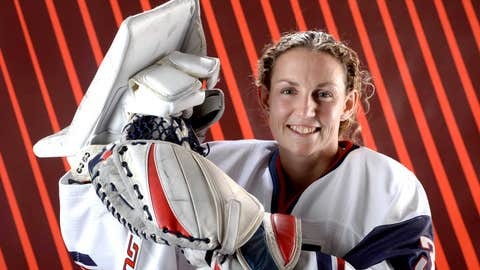 United States goaltender Jessie Vetter has had to rethink the design for her Sochi Olympics mask to make it less patriotic. The original artwork, which debuted on InGoal Magazine on January 6, featured a portion of the Declaration of Independence on the back, a Statue of Liberty on the forehead and the Olympic rings on the chin. A USA logo, made with 23 karat gold leaf embossing, and a screaming bald eagle cover the sides. Unfortunately, the International Olympic Committee has its rules and required some modification to the design. The words from the Declaration and the Olympic rings had to go. The eagle, Statue of Liberty and USA logo got to stay. "No writings of any kind to promote the country is allowed," artist Ron Slater explained to InGoal by email. "A sort of ‘our country is better than your country’ kind of thing that the IOC frowns upon. Her name had to come off because they see it as self promotion. They wanted everything to be team based … Our original idea was ‘land of the free, home of the brave,’ and that would have had to have been removed as well." Check out InGoal Magazine for before and after pictures of the custom face mask.